Ian Miller does not have any MLB stats for the season. Draft: 2013, Seattle Mariners, 14th rd. 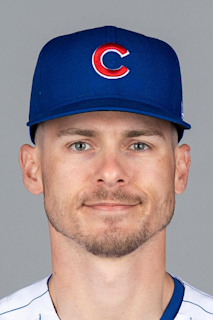 Ian Andrew Miller…resides in Dowington, PA…graduated from Bishop Shanahan (PA) High School in 2010…attended Wagner College (NY), where he played for 3 seasons (2011-13). Received the Ken Griffey Jr. Minor League Hitter of the Year by the Mariners…hit .307 (157x512) with 85 runs, 22 doubles, 5 triples, 4 home runs, 35 RBI, 33 walks and 43 stolen base in 124 games combined between AA Arkansas (4/9-7/21) and AAA Tacoma (7/22- end of season)…led all Mariners minor leaguers with 43 stolen bases…led all Mariners farmhands in stolen bases, while ranking 2nd in hits and 4th in average…since 2015, his 142 stolen bases are 3rd-most in the minors…Texas League All-Star and Texas League Post-Season All-Star…had 20-game hitting streak between Arkansas and Tacoma, July 14 - Aug. 3, batting .386 (32x83)…on 7-day DL, May 31-June 7, with a right back muscle strain…tied for Texas League batting title, 2nd in stolen bases and on-base percentage… promoted to Tacoma on July 22…hit safely in 33 of 41 games with AAA Tacoma. March 19, 2019 CF Ian Miller assigned to Seattle Mariners. February 23, 2019 OF Ian Miller assigned to Seattle Mariners. December 27, 2018 Tomateros de Culiacan activated CF Ian Miller. December 21, 2018 Tomateros de Culiacan placed CF Ian Miller on the reserve list. November 20, 2018 CF Ian Miller assigned to Tomateros de Culiacan. June 30, 2018 Tacoma Rainiers activated CF Ian Miller from the temporarily inactive list. June 27, 2018 Tacoma Rainiers placed CF Ian Miller on the temporarily inactive list. January 16, 2018 Seattle Mariners invited non-roster LF Ian Miller to spring training. July 22, 2017 CF Ian Miller assigned to Tacoma Rainiers from Arkansas Travelers. June 7, 2017 Arkansas Travelers activated CF Ian Miller from the 7-day disabled list. June 2, 2017 Arkansas Travelers placed CF Ian Miller on the 7-day disabled list. February 26, 2017 OF Ian Miller assigned to Seattle Mariners. March 9, 2016 OF Ian Miller assigned to Seattle Mariners. October 29, 2015 OF Ian Miller assigned to Cangrejeros de Santurce. May 28, 2015 Ian Miller assigned to Jackson Generals from Bakersfield Blaze. April 7, 2015 CF Ian Miller assigned to Bakersfield Blaze from Clinton LumberKings. March 4, 2015 OF Ian Miller assigned to Seattle Mariners. September 17, 2014 Clinton LumberKings activated CF Ian Miller from the 7-day disabled list. June 6, 2014 Clinton LumberKings placed CF Ian Miller on the 7-day disabled list. Back injury. April 26, 2014 Clinton LumberKings activated CF Ian Miller from the 7-day disabled list. April 1, 2014 CF Ian Miller assigned to Clinton LumberKings from Everett AquaSox. August 14, 2013 CF Ian Miller assigned to Everett AquaSox from Pulaski Mariners. June 19, 2013 Ian Miller assigned to Pulaski Mariners. June 18, 2013 Seattle Mariners signed OF Ian Miller.